Recently I was reading an article in the BBC, about graves being exhumed deep under London, for a tunnel project. Black Death graves. The oldest set are very nicely laid out, each skeleton neatly in it's own space, nicely arranged. Poor people, but not too battered. The less-old come from the second round of plague some few decades later, when some 60% of England's population was being wiped out. The article describes these plague victims as having multiple wounds and broken bones, "indicative of the breakdown of civilized society." The breakdown of civilized society. That's the theme of every other blockbuster movie, these days, right? Aliens, floods, volcanoes, zombies. They all lead to the breakdown of civilized society. But the survivors are all somewhat charmingly dressed and very healthy teenagers, with glowing skin and perfect teeth. They don't have unset broken bones and seeping wounds. The breakdown of civilized society. It's not like we haven't seen it in our own lifetimes. Rwanda. Bosnia. Serbia, today. The breakdown of civilized society. When the barriers are removed, and the takers take, and the weak and the young and the unlucky... well, good things don't happen to them. I live in one of the most privileged societies ever to walk this planet. Certainly, as a woman, I live a more privileged life than almost any generation of women has been blessed to live, ever. The protection and blessings this society has given me are uncountable. And very, very fragile. I allude to it, a lot, that breakdown. Every speech I give about climate change, every adaptation I discuss at work for sea level rise, every workshop I attend to plan for resiliency - it's all, really, about the breakdown of civilized society. When we look - when we really look, instead of hardening our guts and pretending that real data is merely a Hollywood movie, scientists are terrified. The data re how fast climate is changing, how high the seas may rise, how harsh the weather is becoming, how many will become climate refugees - it's unwatchable. It's a horror movie where you cover your eyes until the scene is done. And even though climate is my profession, and I speak about it and educate about it and work to make my clients more resilient - I'm scared. And I walk the walk and talk the talk without ever letting that reality in. I can't let it in. It would be paralyzing. So I go on with my privileged life, planning my next dinner party on one hand while teaching - trying to teach - my children with the other, how to be grateful, to cherish this moment, to hang on to this life we have as long as they can. I want to give them roots, deep roots, in a civilized society. And I want to give them strength for whatever is to come, in case... civilized society may ... change. And so I lecture on the fact that so many of our scientific predictions for climate have come true decades faster than we'd feared, and the world is changing under our feet so much faster than we can plan for, and then I shut my laptop and unplug my thumbdrive and put all those fears out of my head, and I go on. I turn back into everymom, and take my kids to the beach. In April, we went to the beach. It was one of those rare, perfect tidepool days: the full moon, which (along with the new moon) causes the largest tidal ranges, and thus the lowest tides of the month, was out mid-day, and on a weekend. 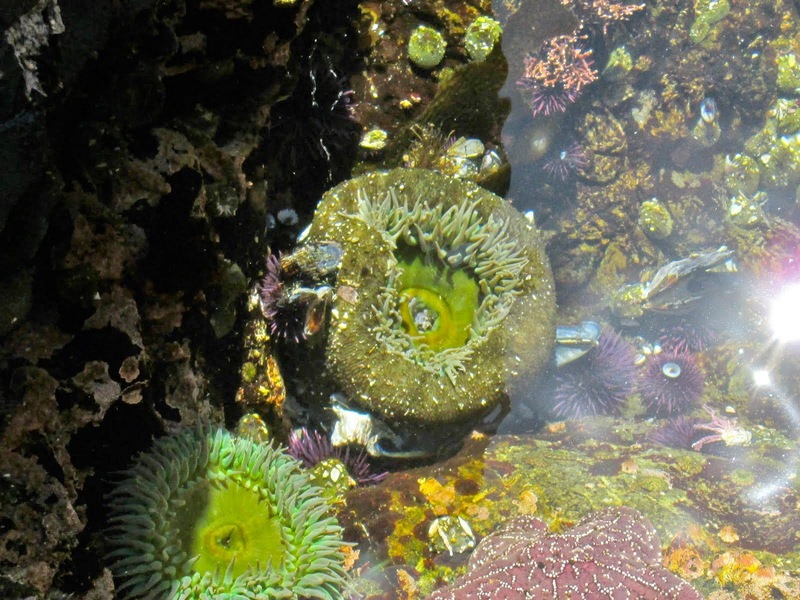 The holy trinity of tidepooling, that is: full moon, midday, weekend. Doesn't happen often - and mostly on our coast, in December and January. So off we went, ready and prepped for a great day on the shore. Everything was right - the sun was shining, it was neither too hot nor too cold, the water was clearer than 90% of the days off this coast. Look at this sky! It started off beautifully. We found seals. They smell. We found a giant eel hiding in a tiny crevice, much too small for anything to be hidden in, and yet. We fed him a bit of mussel, so we could lure him out and see more of him. It's always a bit of a triumph, luring the hidden gems out of rocks with unbelievers watching on. Works with octopuses too. You see, or suspect, a tiny something that others don't see, crack a mussel, drop it in, and voila - the best kind of rabbit out of hat. We found sculpin and hermit crabs and rock crabs and urchins and anemones. See-through shrimp like tiny, darting bits of colored glass. Empty abalone shells, mother of pearl in rainbow colors. What we didn't find is what I was dreading to find. Sick sea stars. 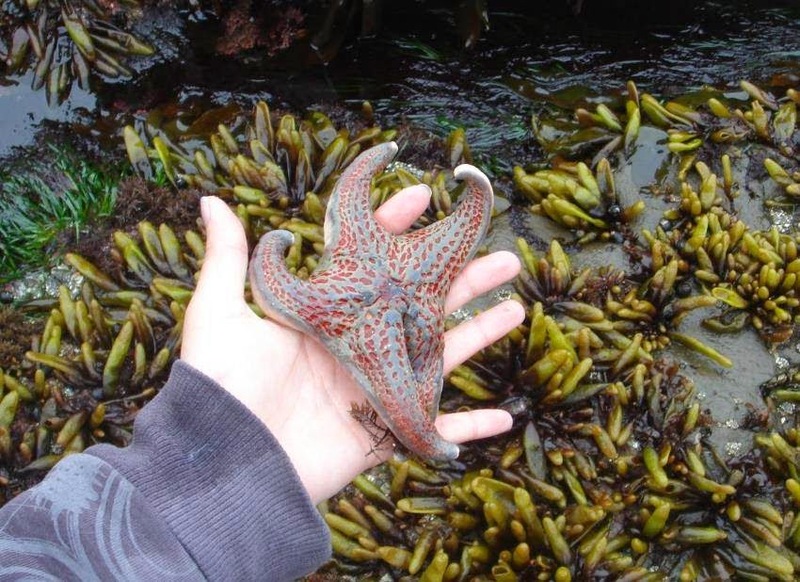 Right now, up and down the Pacific coast, from Mexico to Alaska, and even into the Atlantic, sea stars are getting sick. No one has figured out why. It's a vile illness - their flesh melts, their arms drop off, they die. 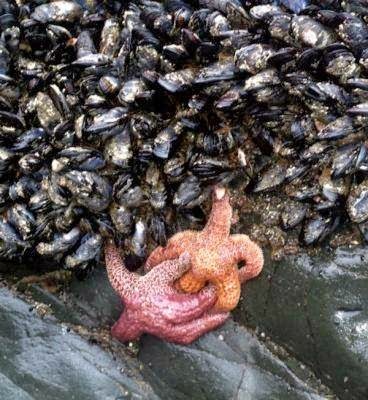 I really, really, really did not want to show my children, or my friends, melting sea stars. Frankly, I didn't want to see it myself. But we were going to one of the most beautiful, healthy tidepools in Northern California, and I had hopes that it wouldn't have hit here. I visited just a few months ago - the stars were fine. 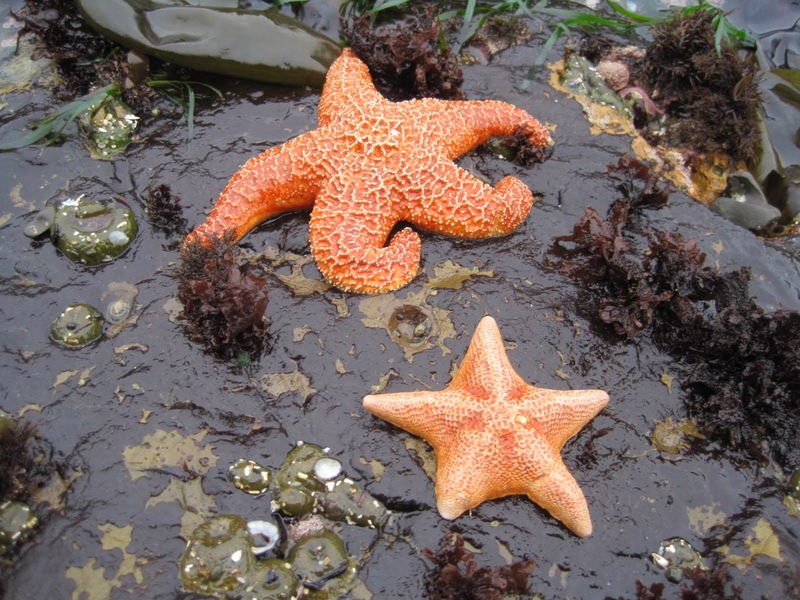 It matters, actually, more than one might think, how the sea stars are doing. I don't say this from the standpoint of "we are all beautiful in God's eyes" or "everyone has a place on this planet however so humble." 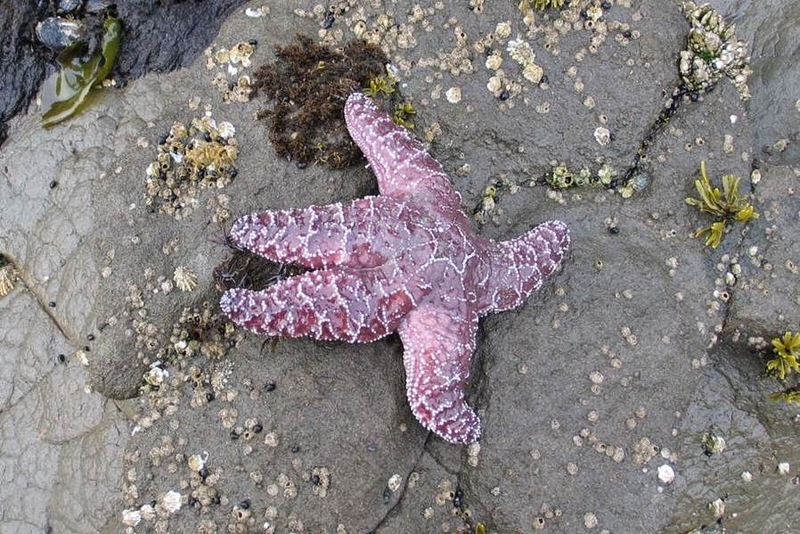 Sea stars are key stone species. In fact, they are the original key stone species, the first identified, the species for which the ecological use of the term was coined. 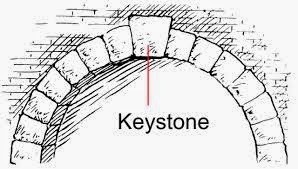 A keystone, oh yea undescended from architects, is that stone, which, when set in the top of an arch, as of a bridge or an archway, keeps all the rest of the stones from falling down. It holds up the arch by its very presence. Without it, there is no bridge, no chapel, no igloo. There is, however, plenty of rubble. At the bottom of the bed of mussels, sea stars. Sea stars, which are voracious predators of mussels. So Dr. Paine began removing the stars, and he removed them consistently for three years. At the end of that time, the mussel bed had grown and spread much lower on the rocks. 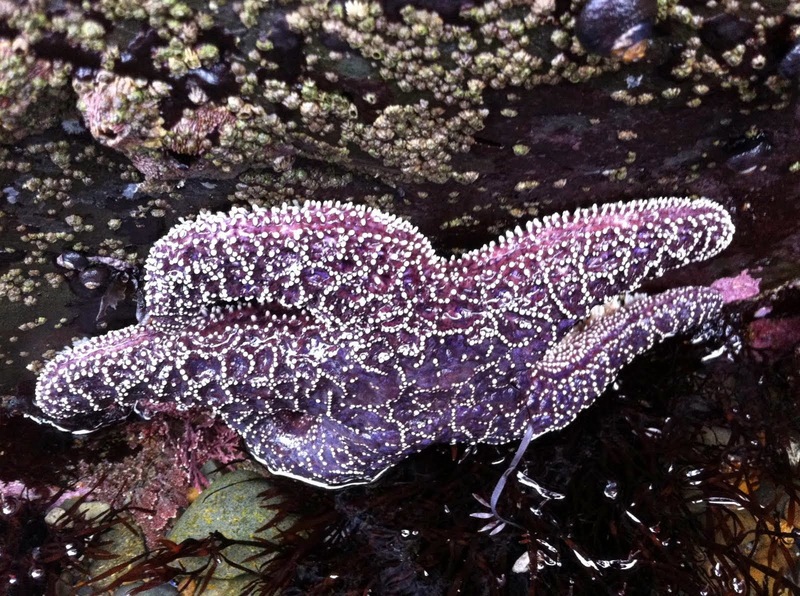 Stars eat mussels, but can't spend as long out of the water - so they can't live as high on the rocks. 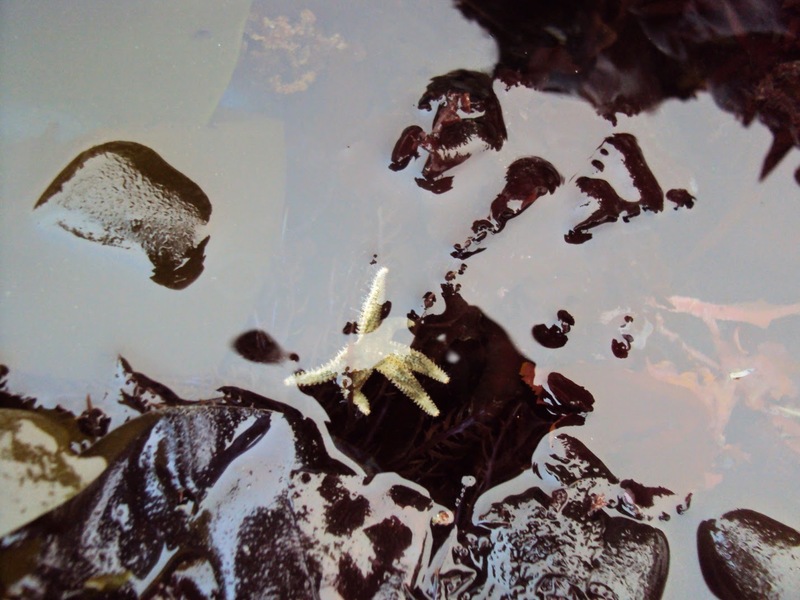 The stars were setting the lower limit of the mussels' survival zone (niche). 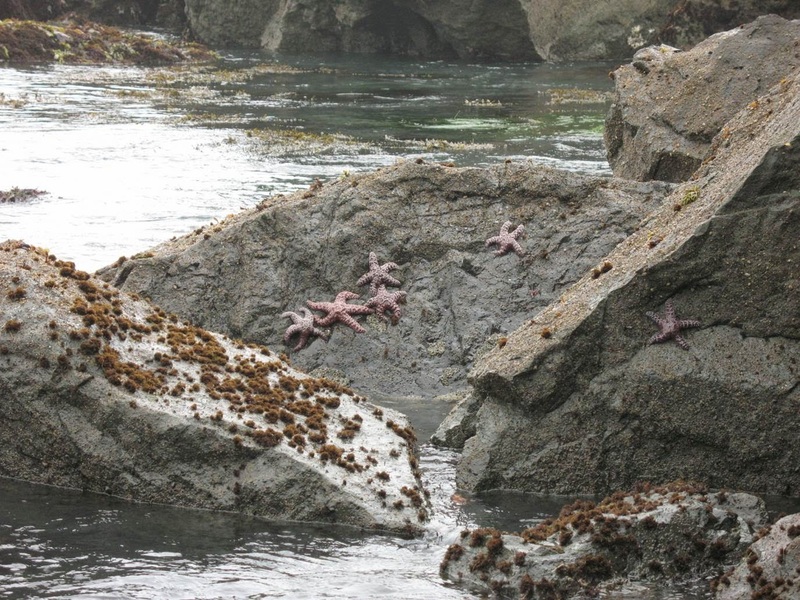 So Dr. Paine set up cages, in the intertidal, with wide mesh, but mesh too small for stars to get in. Outside his cages, on average, 15 species shared each portion of rock. Within the cages, mussels grew thick, excluding other animals, and on average, only 8 species survived. 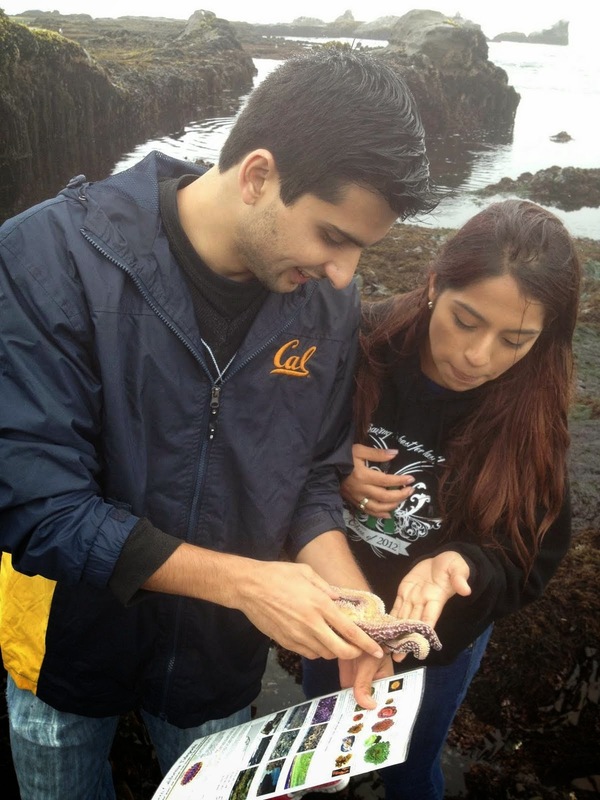 By eating mussels, stars were creating an environment for diversity to thrive. Their impact on the community was large, and greater than would be expected based on their size, or total biomass. They were the keystone, the community member that held the entire community in place. 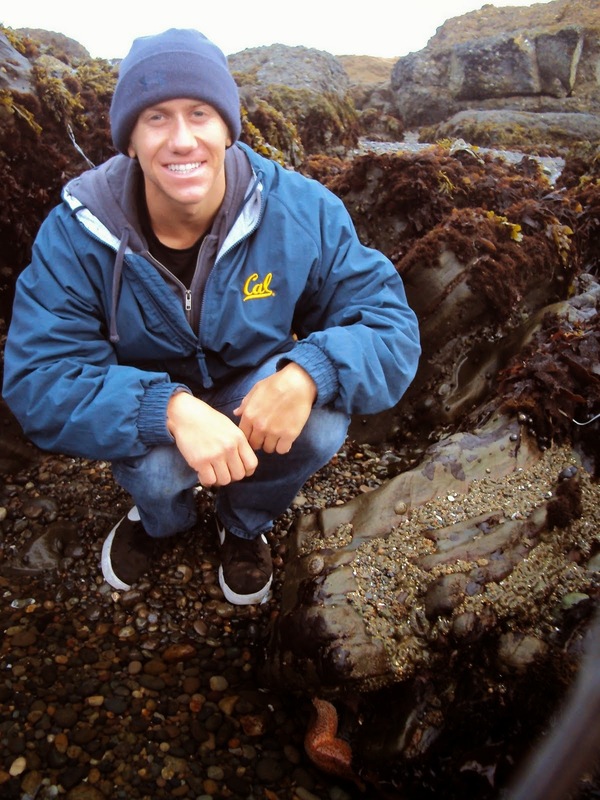 "I went to Half Moon Bay with other six classmates in 9 August. The weather is very cold and we drived more than one hour before arrving at this tolepool. But I saw a amazing nature! I found many species that I never melt even I have gone many beaches in my country. It was special and wonderful. The following pictures are taken by myself which all make me surprised. Thanks, Prof. Although I may not understand what you said sometimes because my English level, I must go there again when I graduate from my university. Thank you very much." As part of the course, we study the concept of keystone species. We watch movies of the urchin barrens that form when otters are removed from kelp forests. We discuss Robert Paine and his groundbreaking research. We discuss the incredible diversity which is found in these thin strips of shore, and the many and complex reasons for them. 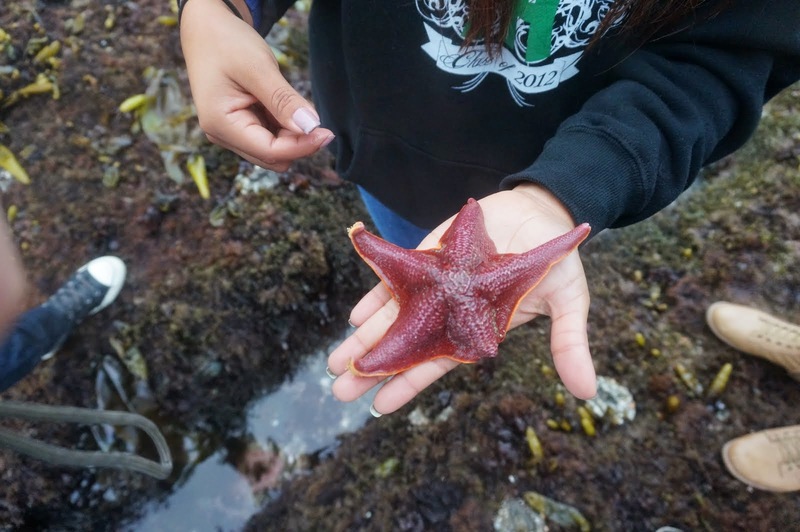 And then we go, and we find it, and my students take dozens of photographs of the many, many amazing life forms that they find, and write up their findings in a tidepool paper. There are always stars. 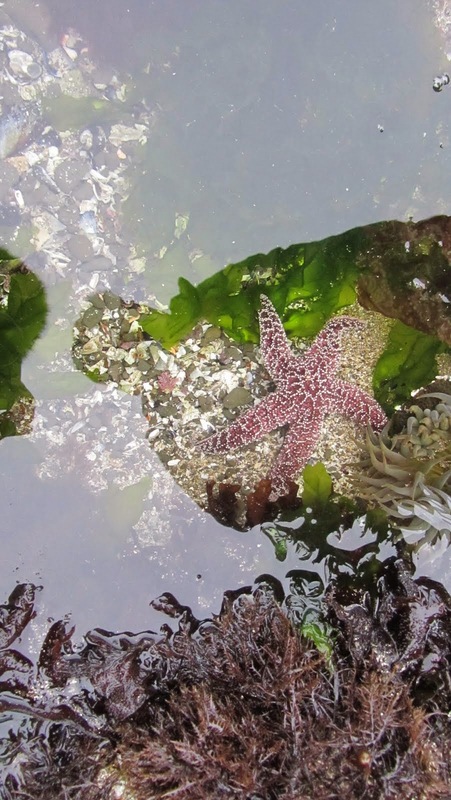 I don't know that I have ever received a final tidepool paper without at least one photograph of stars, and often there are many species represented. So I was expecting stars, that day in April. Lots of stars, and I devoutly hoped, healthy stars. After about 20 minutes of roaming, feeding eels, finding urchins, and generally reveling, I came across a ranger performing a diversity survey, and, somewhat hesitantly, asked whether any sign of the sea star wasting disease had been found in these pools. "No," he answered, to my great relief. "but we're not finding any stars, either. Diversity of all the invertebrates is down." I looked at him. He looked at me. I couldn't find anything to say, not even a follow up question to ask. I backed away, and gathered up my kids and friends and set out deeper into the pools, looking. Of course there were stars. Of course there were. Here were the urchins. Here were the mussels. Anemones were everywhere. The pools are teaming with deliciously beautiful, tiny glass shrimp. How could anything be more alive or beautiful than this? The stars were here three months ago. I SAW THEM. Surely, SURELY ten thousand stars could not have melted in three months. We found one. In three hours of roaming, on ten plus acres of tidepools. I went home and I googled. Some aquariums lost every one of their stars in a single day. It's happening....everywhere. What happens to an arch when you take out its keystone? 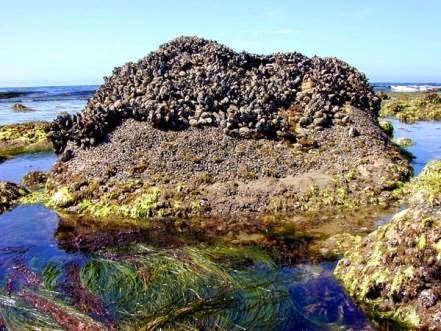 What happens to a tidepool? What happens to our coastlines? An entire class of organisms gone - not one species, or one genus, or one family, or one order. A class. Kingdom, phyllum, class, order, family, genus, species. Is it a disease? Is it linked to global warming, or ocean acidification, or radiation from Fukushima (this one appears unlikely), or something else besides heat and acid and radiation that humans have poured into our oceans? Plastics, pesticides, drugs, heavy metals? Is this something else we've done? If so, what have we done? What if they don't come back?